Former Conrail Sodus Bay Secondary Track - MP 1.3 to MP 16.6 (track north of the PRR/NYC diamond in Wallington placed out of service in the 80's, and much of the track was abandoned in place). 3 ALCO S-4 1953 80941 ex Conn Central 36 exx G&W 36 and 1776, exxx NYC 8655, exxxx P&LE 8655 - recently restored by OMID and repainted in Dale Earnhardt inspired style. The OMID serves fruit and vegetable processors, as well as a chemical company in Wayne County on the former NYC Hojack and Penn RR lines with a connection to Conrail in Newark. The line runs east-west from Wolcott to Webster, and north-south from Sodus to Newark. At this time, Xerox does not use rail for shipping/receiving, as all the grade crossings on all the sidings in Xerox's property have been paved over (there has been talk that Xerox may resume rail service in the near future - when they were on-line, traffic to Xerox was sporadic and there has not been any since the 70's). Most of the rail in Monroe County is light 80 pound stuff. The line running north-south from Rt. 104 in Sodus to Sodus Point, while still in place - but the grade crossing over Rt. 104 was pulled up years ago, is for all intents and purposes abandoned as there are no potential customers north of Rt. 104 (at one point, there was a coal rail float operation from Sodus Point to Ontario, Canada... the operation ceased in the 50's due to problems with the lake levels preventing access from Sodus Bay to Lake Ontario). The Ontario Midland also runs very popular fall foliage passenger excursions in September and October (this year sold out quicky as I found out the hard way, so reserve early!). The 34 mile trip in vintage NYC stainless steel cars takes passengers from Sodus to Newark and back in 2 hours. HISTORY: The Sodus Point line was built by the Sodus Point & Southern Railroad, which was chartered in 1852 but not opened until 1872. In 1875 ut was reorganized as the Ontario Southern, and seven years later as the Sodus Bay & Southern. 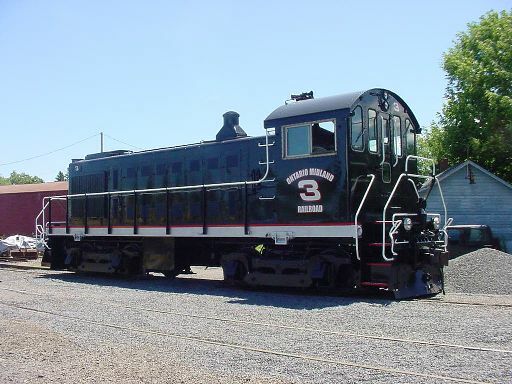 In 1884 it was sold to the Northern Central Railroad (Pennsylvania RR). The Webster line was built by the Lake Ontario Shore Railroad, which was chartered in 1858. That line was sold to the Rome, Watertown & Ogdensburg in 1875, and the following year it became part of a through route from Lewiston, near Niagara Falls, to Oswego. RW&O became part of the New York Central and this line earned the nickname "The Hojack Line". OMID service started October 1, 1979. Most of the Hojack was abandoned west of Webster by Conrail in 1979.